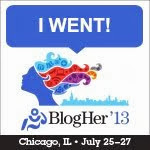 I recently went on Pee-Wee's Big Adventure Cindy's Big Adventure to BlogHer '13 in Chicago. Although I did not end up in a giant Tyrannosaurus Rex's mouth with a waitress named Simone, I did, of course, come home with writing material from my trip. 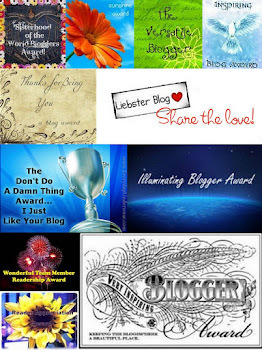 I have so much material that it will take many blog posts to tell my tales. I may have to start a mini-series. At first, I thought I would drive. Silly me. I checked the hotel website and saw that it was $49 per night for big city parking. Don't you want to kiss me before you... well, you know. A Lyme disease flare cemented the decision to ride the rails and off to the train station I went. I excitedly boarded the train (business class, thanks to my mama's generosity) and took a picture to prove how happy I was about it. I settled in, picking a single seat so that I could work privately on several projects I carted along with me. Instead, I did nothing. I rode the train and felt important. In business class, you get a few perks. Waiting in my seat was a copy of The New York Times newspaper. Oh joy, look at the front page story! 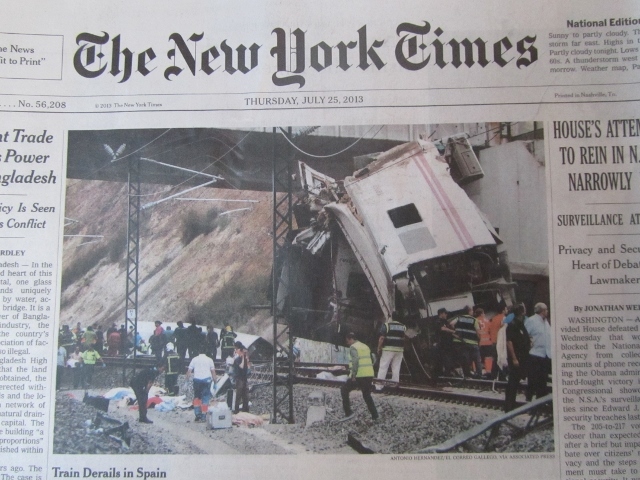 In case you can't read the fine print, it says, "Train Derails in Spain." Wait, it says what? Is that a passenger train? Yes, of course it is! 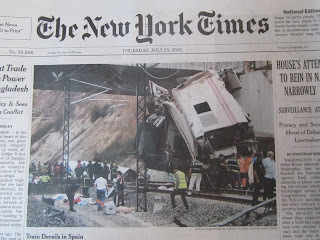 Not only was there a story on the front page about a horrible train accident, there was another train accident story inside. Double joy! I must say, reading The New York Times quite depressed me. Gloom and doom are totally not my thing and I had been excited about my trip before picking up the news. I painted my fingernails in the cafe car at a table by myself while some young men drank beer before noon and played cards at the tables behind me. I drank coffee, which eventually prompted a trip to the loo. I managed to urinate in the awful little bathroom which smelled like a port-a-potty. I held on to the handrail with a death grip while simultaneously balancing in hovercraft position over "the hole of the unknown." It was terrifying. Returning to my seat, I put the paper of doom out of sight and watched the world go by my window seat, fast and slow, boring and somewhat exciting. The train ride was a bit bumpy, but I tolerated the bumping and swaying rhythms just fine. That is, until we did the "this is normal for this train, folks" backing up part at Union Station. Then, I got my first taste of sea-sickness in Chicago. My second and third cases of sea-sickness were compliments of the cabbies and shuttle drivers in Chicago, but the train backing up was the worst. I resisted the urge to hurl, for there were no barf bags on the train, you see. Overall, the trip to Chi-town on the Amtrak train was uneventful. I didn't die. How bad could the trip back be? Well, worse, of course. I got to the train station in Chicago for my return trip half an hour early, as instructed. After wandering around quite lost, I asked for directions and found my spot in line where I waited for the half hour and then an hour more. They were working on the train doing, "mechanical work," and there would be a delay. I wondered to myself why they couldn't just lie and say they were doing maintenance. That sounded so much better. And safer. As we boarded the train, I noticed brake pads strewn about near the wheels. Brake pads? BRAKE PADS! Hold on, they were working on the brakes? Yep, the conductor with the great sense of humor confirmed that indeed they had been working on the brakes and the train was as good as new! Well, whoopee, I'm going to die. I texted a few people, just so they'd know the cause of the crash. 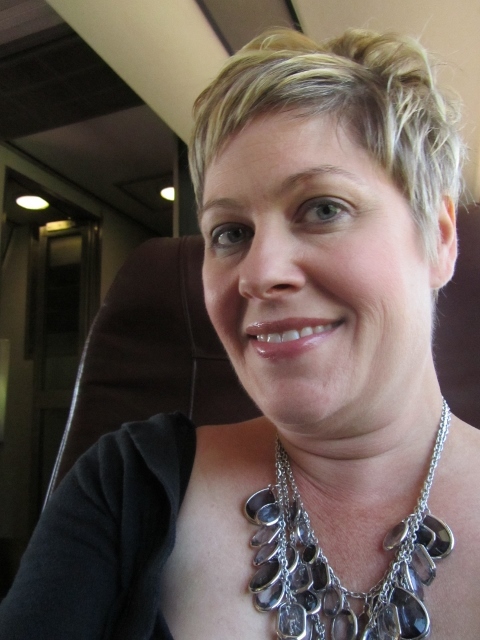 I envisioned the headline, "Brilliant aspiring writer dies in horrible passenger train crash. Brakes to blame." Alas, there was no crash. I did not die. At least, I assume I'm not dead. If I am dead, it is good to know there is blogging in the afterlife. Settled in again with many projects still to be done (which I never did), I realized the trip home would be a long one. The woman directly behind me was obviously very ill and she coughed approximately every 3 minutes like clockwork. As the trip wore on, she began to sniff between coughs. She was still on the train when I got off. So yes, she coughed and she sniffed toward the back of my head... the whole 3-1/2 hours. As if that wasn't bad enough, about an hour before I blissfully disembarked, a woman got on with her three small children... in business class. A wide-eyed, squealing toddler, clearly over-stimulated, plus a kid about three who wanted to ask everyone everything known to man, and a kid about eight who did mind his own business. The mother was clearly frazzled. It was entertainment, but not the good kind. I considered the trip on the Amtrak as I exited and deemed it a good melting pot experience. Amtrak, thank you for not killing me. I could not have driven those Chicago streets on my own and am thankful for your transport of my weary body. In the end, you served me well and your soft pretzel was wonderful, even though it had no salt on it and the package clearly stated it would be salted. I forgive you this gross oversight since it was a sealed microwaveable package and this was obviously a factory defect. The nacho cheese covered this sin effectively, thank God. Wow - I LOVE train travel! I can't imagine why anybody wouldn't! Proximity to sick people is much less contagious than on a plane, but I guess the "safest" trip would be by car. I grew up making the 400mile Amtrak trip from Toronto to Albany to visit my grandparents, and although it was slow, long, and sometimes hot, it fuelled a pedantic love of international train travel....which I'm currently writing a book about. Cindy - too funny, I have had travel experiences like that so I can relate!! Glad you made it there and back in one piece. 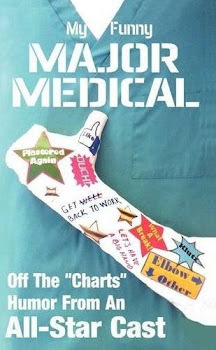 Can't wait to read more!!! The bathroom experience reminded me of our trip in May. Very funny. Oh too funny. I cut my teeth on train travel in Europe and LOVE it but I have to agree, US travel is far less exotic and exciting!! It's mundane and downright scary sometimes...lol I don't remember the bathrooms being that bad though the food... nothing short of inedible!! Yeah, if you want to park in Chicago, basically you need to have a salable body part (I'm thinking KIDNEY, what?!?) in order to afford it. Love riding the rails but that sounds... interesting, not in the funnest way. I love children, but not when trapped in a small space with them. At least that part was only an hour, unlike the part with Typhoid Mary. I love your stories! And sometimes I do think there is blogging in the afterlife - but only in hell. LOL. My first train ride as a teenager we hit a bump as I was walking back to my seat with a soda. I spilled half of it on a sleeping man and then ran back to my seat in terror. I went thirsty the rest of the trip because I was to afraid to walk by him again. I've always wanted to ride Amtrak. Until now. Glad you're not dead. Yeah, me too! I will likely ride again, despite the inconveniences. I didn't get sick when I got back, thankfully! And yeah, kidney... how about my right arm? Sheesh. I know! I wonder if they paid attention to the headline at all when doling out those papers. They probably thought, "Oh, this is poor timing for us." I'd like to ride a luxury one someday. I rode a train in France that went like 200 miles an hour or something and thought it would be so great, but you couldn't see any scenery because the train was going so fast! Fail! Strange bathrooms are bad enough, but when they're moving... well, that's a challenge! It was fun. Not as glamorous as I expected, but fun. :) I'm so glad you had fun! So glad I got to meet you and so many other fantastic peeps.